One place of Hills of Bali's Instagramable, Melasti Beach has a major attraction in the form of a location located on the edge of a steep limestone hill and very many curves. 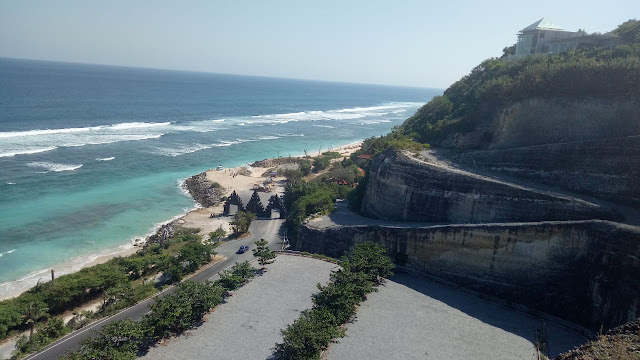 This very spectacular sight of Melasti Beach can be seen from the top of the steep limestone hill, there are even special stairs for pedestrians to climb up to the top of the hill to be able to see the whole Melasti Beach from a very high place (approximately 150 meters from sea ​​level). 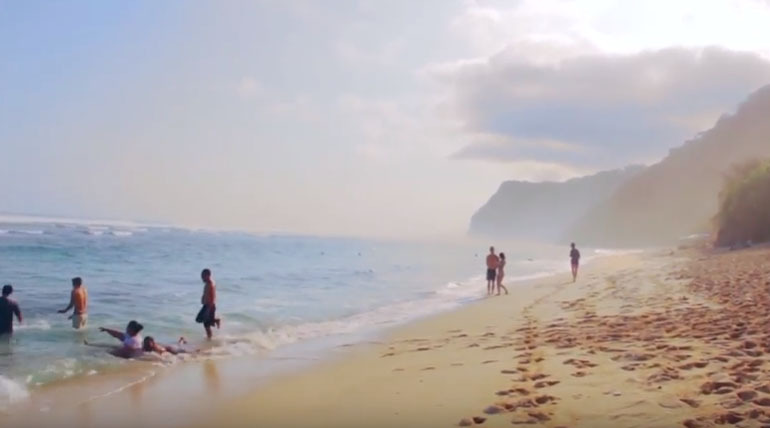 If observed on social media such as Instagram, Facebook and so on, the streets of Melasti Beach which is located between ravines and steep limestone cliffs often become the background of the photos uploaded by them. A very clear blue sea, which is one of the characteristics of beaches on the southern tip of the island of Bali, is also the main attraction of Melasti Beach. Small fish that are swimming during low tide can be seen clearly from above. The unique scene that occurs during the low tide on Melasti Beach is the presence of stone cavities that form a pool, which looks green from above. Visitors usually like to soak in these cavities at low tide. White and soft sand Melasti Beach should not be forgotten, this is what makes visitors feel at home for a long time playing or walking with empty feet on the sand of this beach. Visitors who bring children usually release children playing on the sand on this beach, because when the high tide on Melasti Beach is quite insecure as a place for children to play water, unlike on the beaches of Sanur (Beach Sanur, Sindhu Beach, Matahari Terbit Beach) are more suitable for children's water playgrounds. The existence of small-sized rocky caves adds to the variety of tourist attractions in this. Visitors to tourist attractions that are afraid of heat can take shelter in the small caves. These caves can accommodate visitors reaching a dozen people, which is why visitors are more free to put their luggage in this cave while sitting relaxed in it.